Koratala Siva who has made a name for himself as a blockbuster director in Tollywood, after tackling a diverse range of topics such as Factionalism, Environmental Concerns and Rural development in his previous offerings decides to approach the subject of politics and the cost of leadership, and has collaborated with Mahesh Babu for a second time after their first outing together, Srimanthudu, was a massive blockbuster. But, will their follow up effort be the first Telugu blockbuster of the summer? More importantly, will it be a source of relief to its star, Mahesh Babu, who is currently recovering from the disastrous performance of his last two movies, Brahmotsavam and Spyder? Bharat Ram (Mahesh Babu), a young academic in London, is forced to rush back to his hometown of Hyderabad, upon the death of his father (Sarath Kumar), the chief minister of an undivided Andhra Pradesh , only to be informed by his father’s best friend, and the party chairman Varadarajulu (Prakash Raj) that to prevent the party from splitting between 2 factions (P Ravishankar and Posani Krishna Murali), he is expected to take over the post of Chief Minister, while also fending off the attacks of the powerful opposition leader (Devraj). The young and inexperienced Bharat, decides to take on the problems of the state head on, while also trying to take care of his family, finding love in a young civil service aspirant, Vasumathi (Kiara Advani) and dealing with the political intrigue that comes with his post. But as he makes tough decisions by the day, will friends turn into foes, will the fickle public stay on his side, and will Bharat be able to stay true to himself? Koratala Siva is a filmmaker who tries to balance two diverse sensibilities in his brand of cinema, i.e. a socially relevant issue, while also making it palatable to the masses. He got the balance perfectly with his first 2 movies, but he seemed to be losing his grip during Janatha Garage, and more so in this movie. He seems confused about what direction the movie should take, and it shows. To be fair, the film does have a few strong moments, like Bharat’s trip through rural Andhra and his encounters with the difficulties an ordinary villager normally faces, and a few dramatic sequences in the second half, but for the most, the movie is just plain bland, and comes across as a hash of Leader, Mudhalvan and for good measure, a sequence from The American President thrown in. Add to that the awkward placing of songs, and the nearly 3 hours running length, and you’ve got a film that stretches the audience’s patience to the limits. Another fault here would be that, compared to his previous films, the characters are not as well rounded as one would hope. 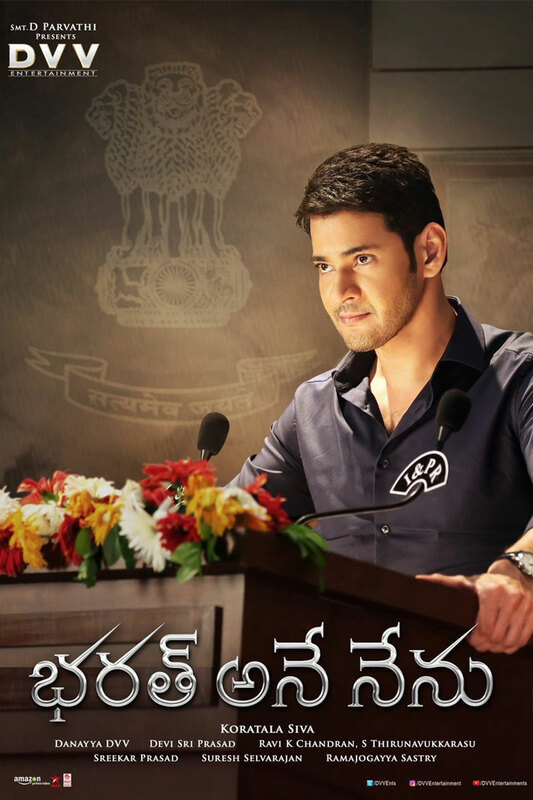 Mahesh Babu is quite good as the young and idealistic politician, and does a fine job of expressing what drives him to do so, but the other characters are not as well developed, which is a massive disappointment. Kiara Advani makes a fine debut in Telugu Cinema, and portrays her role with absolute dignity, but there just isn’t enough of her which is a pity. Even the supporting cast, be it Prakash Raj as the political mentor, P Ravishankar (who also dubs for Devaraj) and Posani as the scheming party members, Devaraj as the wily opposition leader, Sarath Kumar as the dedicated leader, Rao Ramesh as a doting father, Rahul Ramakrishnan as a young village leader, Ajay and Brahmaji as Bharat’s loyal aides, there’s hardly any meat in their characters. To sum it up, Bharat Ane Nenu is a noble effort, but ends up weighed down by its flaws which end up turning the movie into a lightweight star vehicle, rather than a truly memorable summer blockbuster.